Ten Minutes of Connecting: Day 30 – Oh The Places You’ll Go! Congratulations! You have committed time over the past month to become a connected leader. You have found where the learning is happening. You have found places to connect with other colleagues who value learning in the way that you do. Your thinking about your practice may have shifted significantly over the past month, but relationships remain at the centre of our learning. Sometimes, as you share your excitement about what you have learned with your colleagues, you will feel like the voice of the “Lone Wolf”. An important blog post on the loneliness of the innovator by David Truss. Click on the image for the full article. At other times, when you are with your “tribe”, you will feel like you are “preaching to the choir”. This too, has value. Sharing the importance of nurturing the early risk-takers who are modelling the learning we want for our students, but Stacey Wallwin. Click on the excerpt for a link to the full blog post. As a connected leader, you are taking ownership of your own learning. Isn’t this exactly what you want for your students? Shared by Bill Ferriter @plugusin under a Creative Commons Attribution – Non-Commercial License. 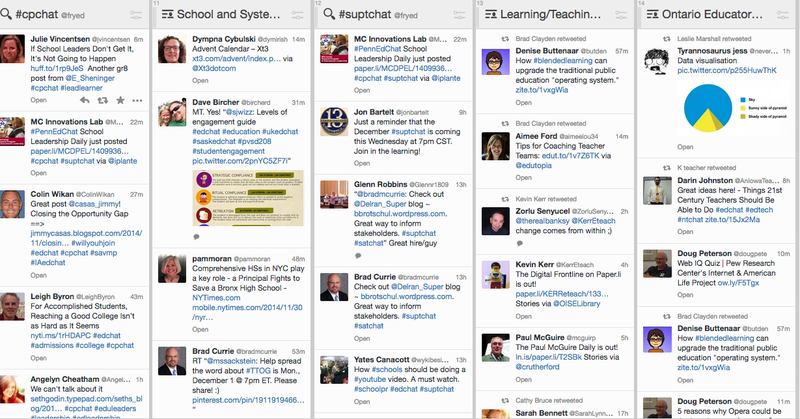 You’ve learned that Twitter is a 24/7 stream of learning for educators. 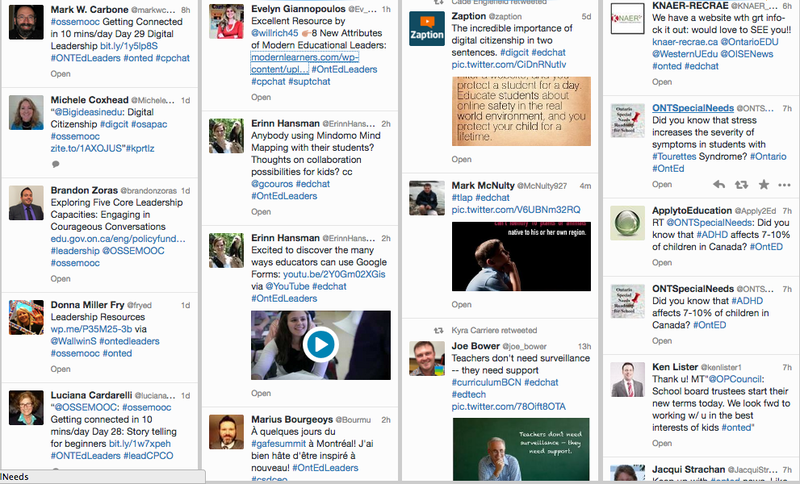 Random captures of Tweetdeck demonstrate how many ideas are flowing at once. Will Richardson shares eight attributes of modern educational leaders here. Understanding where to find the best and most current ideas about education is the first attribute. Look at the number of comments on this blog! 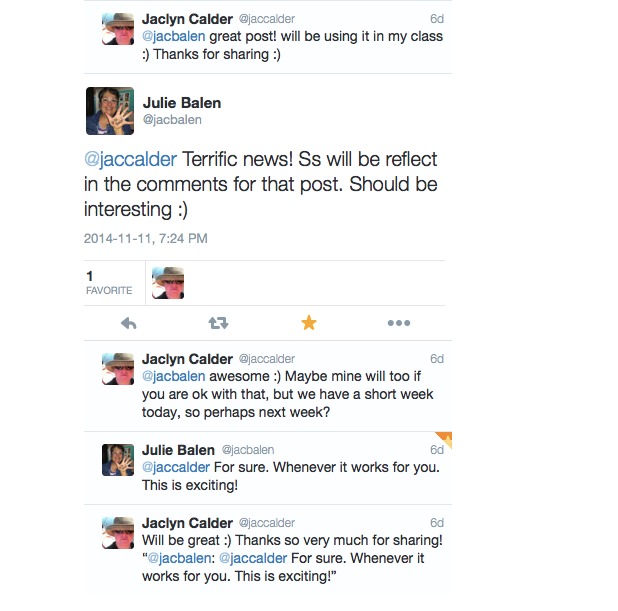 How powerful is this conversation among teachers and student about mindset and learning?! 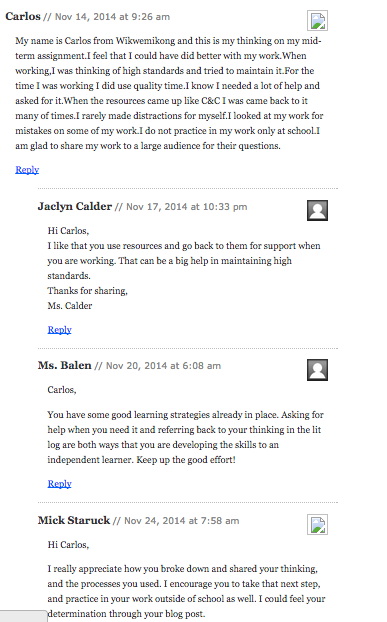 Here is a sample of the kinds of conversations among teachers and students you will see on this class blog. Take a moment to comment on some of the student thinking. As you continue to connect, you will experience magical moments, learning and connecting that grow from your open sharing. Alan Levine expertly collects these stories. I think Ms. Balen and Ms. Calder need to contribute to this collection! Check out some of these fabulous stories of connecting, then be sure to share your story when the magic happens for you. Congratulations on a successful 30 days of connecting. Here at OSSEMOOC, we look forward to continuing to learn from you. Be sure to add your blog to the list through our “Join In” page. Thanks for your participation and feedback. We hope you will continue to add resources to our posts through the comments, and that you will continue to spread the word! 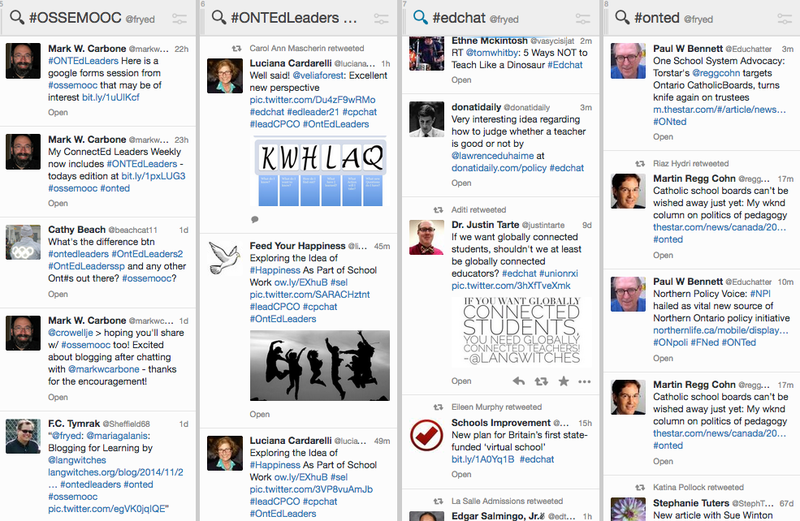 We leave you with some inspiring words from Connected Leaders in Ontario – The OSSEMOOC K12 Online Conference Presentation for 2014.